It is the business of the courts to conduct trials and issue sentences, and the current administration will not padlock shut courts over arbitrary sentences, says President Abdulla Yameen Abdul Gayoom. Speaking during a function held at Sh. 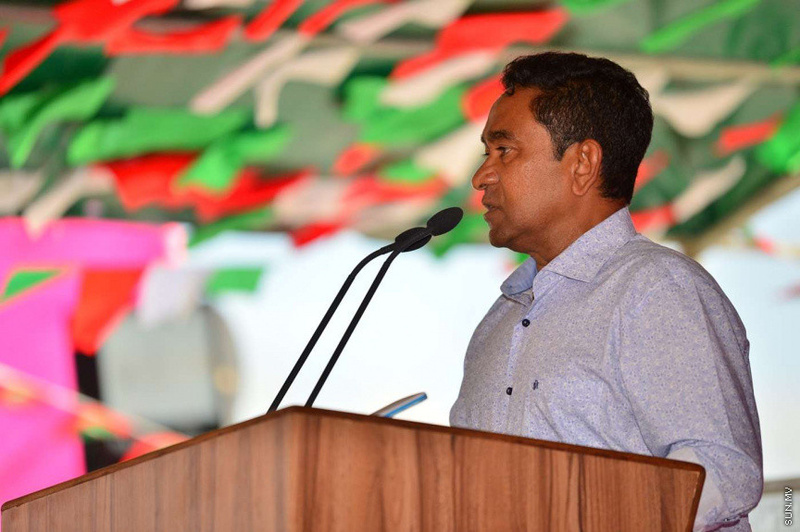 Milandhoo this Tuesday, Yameen said he is under intense pressure from foreign governments to allow former Maldivian President Mohamed Nasheed to complete in the Presidential Elections 2018. Yameen said that issuing sentences “is the mandate of the courts, whether just or unjust”. He said his administration “will not padlock shut” courts which issue arbitrary sentences. “But I will look into what happened. And I will look into how much of the burden I can bear. And what I found during my assessment is clear for all to see. So [former Supreme Court judge] Ali Hameed and [former Chief Justice] Abdulla Saeed aren’t in jail just because they issued an order,” said Yameen. He said he and his administration are facing intense pressure from major foreign countries because Nasheed isn’t eligible to compete in the upcoming Presidential Elections. “What we heard is that there is no democracy in Maldives if President Nasheed isn’t allowed to compete. And foreign powers pressured me to allow it,” said Yameen. Yameen said he doesn’t have the authority to make such decisions by himself, but that he tried to make the way for cater to their demand. He said he requested the courts to expedite the legal procedure after he received numerous letters from Nasheed requesting it. He said it wasn’t a request he himself initiated. “And the sentence that has been issued against President Nasheed is legitimate. I cannot change it as long as it’s in effect. It’s not within the President’s power to change sentences. February 1 proved its done by the courts,” said Yameen. He said he has been facing intense pressure due to appeals made by the opposition to foreign governments claiming lack of democracy in Maldives. He said it has led to suspension of certain incentives on products exported by the country. Yameen said what foreign governments object most to is the refusal to allow practice of any religion except for Islam in Maldives. Yameen said his administration will not look by as people invite foreign powers to exude influence over Maldivian or invade Maldives.